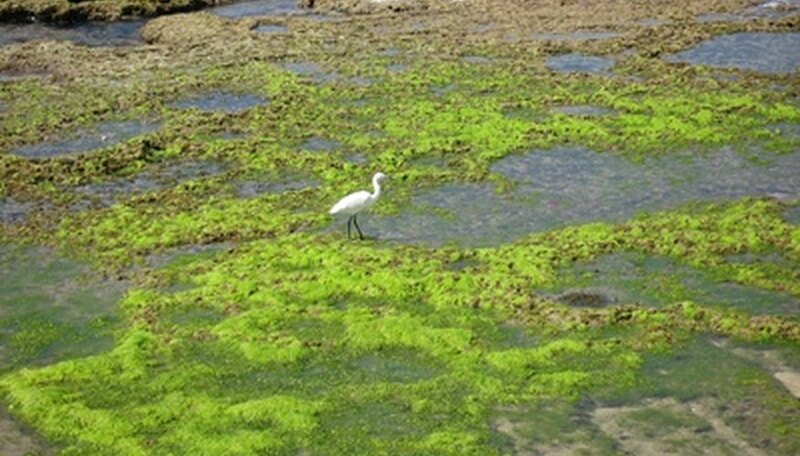 Sea grass is a plant that grows in salt water, including salty ponds in your back yard. It is in the group of plants called submerged aquatic vegetation. While seagrass has flowers and seeds, roots, leaves and tissues, the stems are weak and the blades move with the currents and waves in the water. If the seagrass is taking over your backyard pond, there are a few ways to kill it. Check in with your state to see if there are laws regarding sea grass preservation. The state website or Department of Environmental Conservation website should contain the information. Block the sunlight from reaching the sea grass in your back yard. It needs sunlight to grow. Plant trees above the pond or algae in the pond to create a barrier between the sun and the seagrass. Apply fertilizer to the algae to it can grow large and block as much sunlight as possible. Put a plastic tarp over the salt water pond. The plastic will have a similar effect as the plants and make it impossible for the sun to reach the sea grass. Hammer stakes into the ground to hold the tarp in place. Leave the plastic there for two weeks then remove it. Pick up the dead sea grass with a shovel. Scrape it along the bottom of the pond. A metal rake will also work. Pick up the grass and seeds. Apply aquatic herbicides to the pond. Sea grass is delicate and cannot survive the chemicals. If there are other plants in the pond, expect them to die, too. Drop the herbicide in during the early spring before growing begins. Read the label for application instructions. Pull the seagrass right out the pond. If the roots are removed, the grass dies. Read the label thoroughly before handling herbicides. Remove fish from back yard ponds before killing sea grass. Put them in a tank with pond water.